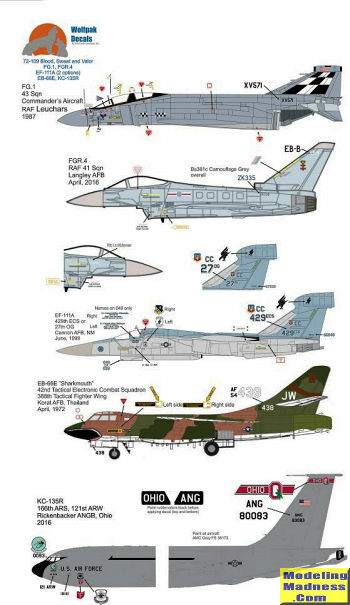 This sheet has another nice selection of jets on it from Vietnam to modern day. There are six different markings option provided for this one. First up is a 43 Squadron Phantom FG.1. The FG.1 was an ex-RN aircraft and only served with two RAF squadrons. This is the commander's aircraft from 1987. This scheme was later expanded to include the upper fuselage. From April 2016 is a 41 Squadron Eurofighter FGR.4. This one is from a visit to Langley AFB. 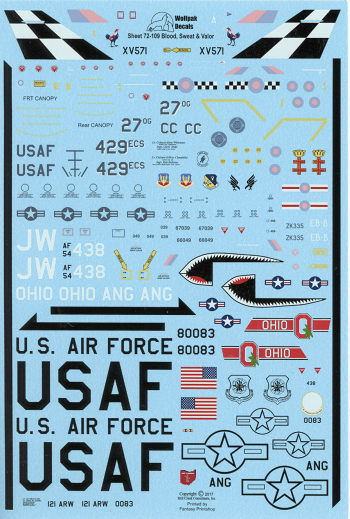 There are two EF-111As on this sheet. One is the boss bird of the 429th ECS and the second is with the 27th OG. Both are from 1996 when they were based at Cannon AFB. The EB-66E is a shark mouth plane with the 42nd TECS when based at Korat AFB in 1972. Finally, the big one, a KC-135R with the 166ARS based at Rickenbacker ANGB in 2016. As you might expect, the decals are superbly printed by Fantasy Printshop. The sheet's outstanding instructions provides complete drawings of all these schemes to ensure that you will be able to duplicate them.